Former Fuqua Dean, Rex Adams, is a bulldog of a man with a blunt communication style. He grew up in modest circumstances in rural West Virginia and attended Duke on a football scholarship. During his long career at Mobil, he rose through the ranks to the executive suite. After retirement, he returned to Duke as the Dean of the Fuqua School of Business where he cultivated a talented team of staff members to accomplish his goals. I thought of Rex often when I read a new book, American Turnaround by Ed Whitacre, the former chairman/CEO of AT&T and later GM. When this story begins, Ed Whitacre is living in Texas, retired CEO from AT&T, where he worked 44 years. The year is 2009, soon after the Chapter 11 proceedings and the $50 billion bailout of General Motors. Car czar Steve Rattner asks Whitacre to serve as chairman at GM and he agrees. When Whitacre gets to Detroit, he discovers a chaotic management structure, with no clear lines of authority or responsibility, and no sense of accountability. Senior leadership seems unsure about their roles in the company. There is no sense of urgency, no teamwork toward crafting a solution. Whitacre holds senior management completely responsible for the bankruptcy and he immediately institutes changes. After simplifying the organizational structure, he replaces top management, but because salary caps under TARP are uncompetitive in the industry, he taps talent from lower levels in the company. Then he fires the CEO and assumes that position himself. Whitacre takes steps to change the culture at GM. He goes on “walkarounds” to talk to employees throughout the company, and to union leadership as well. He presses his management team to clarify and simplify their communications and presentations to the board. He begins the process of building confidence in the company with a strong message and a plan for returning to profitability. As CEO, his role is to articulate a higher vision and to communicate it to the entire organization to get all levels, entry-level to top managers, focused and moving in the same direction. At the heart of the book is a flashback to Whitacre’s formative years in rural Texas. While a senior at Texas Tech, he takes an internship at Southwestern Bell, where he rises through the ranks to chairman and CEO. Under his leadership, the company is transformed into the telecommunications giant AT&T. Whitacre discusses the people and strategy at the company, and uses this material to explain the development of his management model – to run a lean operation staffed by people with clearly defined jobs, accountability and authority. American Turnaround is a heartfelt story and an entertaining and rewarding book. The writing is both personal and blunt, replete with verbal tics, you know? But like any conversation, the story is subjective. Whitacre says much about his leadership philosophy but he includes few details about strategy at either AT&T or GM. Whitacre writes about men by name, but women are invisible, “this lady in a white coat” (at the GM lab) or “this woman” (who managed the Corvette plant).” The only woman manager named at either company is GM’s head of marketing Susan Docherty, but after she conflicts with Whitacre’s heir apparent, she finds herself in Shanghai. In addition, key details are missing. Near the end of the book, President Obama meets with Whitacre, but the reader is not told what motivates the President to say, “I hope you will stay.” And it is puzzling why, during the same meeting, Whitacre decides to resign his position. He serves at GM for only 18 months. Yet despite the flaws in American Turnaround, I highly recommend this lens into the mind, views and opinions of American corporate leadership. Well worth reading. Connaughton, Jeff. The payoff : why Wall Street always wins. Easton Studio Press, 2012. Also in audiobook format. This insiders account of how Wall Street manipulates Washington explains why no financial firms or individuals have been prosecuted for causing the 2008 financial crisis, why our too-big-to-fail banks have grown even larger, and why our leaders in government fail to support financial reform. In the beginning of The Payoff, Connaughton is in Washington in 2009 to seek justice against fraud and misconduct by Wall Street executives and directors. But the Justice Department is unwilling to prosecute and the SEC is administering painless monetary fines. As a “Professional Democrat,” one of thousands in the revolving door between the public sector and the private sector, Connaughton uses his own story to illustrate how government is staffed by a financial elite whose personal agenda differ from the national interest. Ambitious staffers serve in government, then they earn millions on Wall Street while positioning themselves for better political posts in Washington. Public servants in name only, they resist change for personal gain. The Payoff describes the same political environment as Neil Barofsky’s Bailout, which was reviewed in this blog almost a year ago. Both books are personal stories about the difficulty in dealing with the aftermath of the 2008 financial crisis. Both present candid portrayals of the Washington elite. Connaughton’s rendering of Joe Biden is particularly honest and unflattering. Both books detail how change does or does not happen in Washington. Both books are engaging reads yet neither offers hope for the future. At the end of The Payoff, Connaughton calls on voters to reclaim their government from the ruling elite, but does not say how. Both are recommended. Louv, Richard. The nature principle : human restoration and the end of nature-deficit disorder. Algonquin Books of Chapel Hill (NC), 2011. Tercek, Mark R. Nature’s fortune : how business and society thrive by investing in nature. Basic Books, 2013. Darlington, Susan M. The ordination of a tree : the Thai Buddhist environmental movement. SUNY Press, 2012. At this moment, during the first week of term 1, the library is completely full with students seated at every chair and table. Students may not fully realize it, but the natural light and views of nature draw them to the library space. That is by design. The knowledge work in an MBA/MMS program depletes mental resources as focused attention on reading, studying and preparing for class leads to fatigue. The remedy is exposure to nature, including the shared views of trees and sky in the Ford Library, which lift people’s moods and enhance their ability to mentally focus. In The Nature Principle, author Richard Louv examines the mind/body/nature connection. Years ago, he coined the term “nature deficit disorder,” and in his new book, Louv describes “the nature principle,” which holds that a reconnection to the natural world is essential to mental and physical health. He explains that in the modern age, people have placed great faith in technology but the relationship with nature has declined. Human costs of alienation from the natural world include stress, anxiety and depression, as well as problems with attention and focus. Reconnecting with nature benefits both the human mind and spirit. Regarding business, some companies understand that nature offsets stress and they respond by installing on-site gardens or by creating everyday Edens with houseplants. 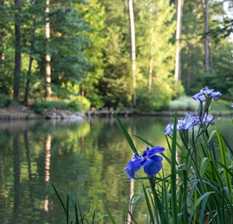 Businesses that want to draw the best performance from their employees connect them with nature. This readable book is both well researched and thoughtfully presented with dozens of stories. Also available as an audiobook. Making the business case for nature is one of the topics discussed in Nature’s Fortune. Authors Tercek and Adams explain the idea of natural capital, putting a value on nature as an asset. Dominating nature has long been the goal of human beings, destined to fail in the long run. However, considering environmental effects in business decisions results in increased long term profitability, and in recent years, a more positive corporate image. Protecting resources needed for production, such as clean water, is more than a business expense, it is an intelligent commercial investment. Global corporations have a disproportionate effect on the environment and these companies are encouraged to form partnerships with environmentalists to help them improve their conservation practices. The authors also encourage governments to create incentives for global businesses to invest in nature instead of degrading it. Examples from many companies worldwide are models of sustainability. Also available as an online e-book. The Ordination of a Tree is admittedly an odd book for a business library, but this title was rated “Essential” by an academic book review service, and not previously held in Duke’s collection. In the book, the environment in Thailand is described as significantly degraded by a small group of powerful and wealthy people. In recent decades, Buddhist monks are leading an ecological movement to conserve forests, preserve clean water, mitigate soil erosion and protect wildlife. Practices include traditional environmentalism, working with local people and NGOs, as well as sacred rituals, including ordaining trees. This is an academic work, interesting but not an easy read. Also available as an online e-book. Available now from the Ford Library, new classic business titles on Kindles. ﻿ Nelson, Jennifer. Airbrushed nation : the lure & loathing of women’s magazines. Seal Press, 2012. Before the Civil War, advice in women’s magazines came from an ethical or health perspective, such as the dangers of wearing corsets and hoops. In 1867, the fashion magazine Harper’s Bazaar was launched and thirty years later, Vogue began publication. Ready to wear clothing, accessories and cosmetics were available in stores. New industries catering to women were formed. Being in fashion became a social necessity, which attracted a congregation of faithful readers. Today, Newsweek and U.S. News are no longer in print, but “chick slicks” like Cosmo, Elle and Self have more readers than ever. As a journalist for women’s magazines, Jennifer Nelson wrote articles on health, fitness and nutrition, and she admits that some of this content was misleading and undermining to women’s self-esteem. In her new book, Airbrushed Nation, Nelson examines the world of glossies and provides insight into the impact on women. She describes the magazines as a space where women are comforted, entertained and advised, a fun place to visit. But she also warns that the self-improvement messages are damaging to women’s self-worth. The air-brushed ideals of beauty and lifestyles lead to self-loathing. And countless articles about crime, disease and danger create anxiety. Women’s magazines sell brands, designers and the magazine itself. The lines among the three are blurred. Clothing designers who spend the most in advertising receive the best coverage in fashion layouts. Articles that encourage readers to improve themselves are surrounded by strategically placed advertisements that “cure” those ailments. For example, an article on losing weight will be on the same page as weight loss supplements. The cosmetic products used on models are not the ones noted in the captions. Long after the photo shoot, an editor creates the captions and lists products by advertisers, truth or not. Much of what seems straightforward is misleading. Nelson calls for outrage, yet little of this is new. Advertisers get prime space in any magazine. Sexualized children have appeared in fashion magazines since 10 year old Brooke Shields was photographed in the 70’s. Misleading labels sold health and beauty products for snake oil salesmen. Changes will only be made after women stop buying these publications; yet even the author purchases these glossies regularly. 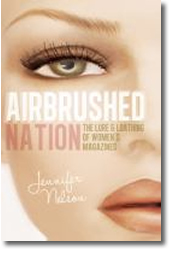 Like the magazines examined in this book, Airbrushed Nation is entertaining. Written in an engaging style, it contains lively sidebars throughout. Recommended for anyone interested in women’s issues or the magazine industry. Lyubomirsky, Sonja. 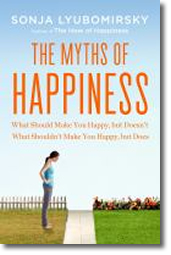 The myths of happiness : what should make you happy but doesn’t, what shouldn’t make you happy but does. Penguin Press, 2013. Labor Day marks the beginning of the academic year, although most college students today begin their studies during the summer months. For newly enrolled Fuqua students, arriving at Duke represents a milestone — the launch of a new career and perhaps a new life. For many, completing their education with an MBA, MMS or PhD degree fulfills a longstanding dream and they expect their achievement to bring an enduring sense of satisfaction. As Sonja Lyubomirsky shows in The Myths of Happiness, academic achievements make people happy, but not as intensely nor as long as they expect them to. In her new book, Lyubomirsky discusses 10 crisis points, milestones in life when individuals undergo significant change. Many of these are positive, such as marriage and parenthood. Negative crisis points include bankruptcy, illness and divorce. Lyubomirsky shows that for each milestone, people exaggerate how happy or disappointed they will feel. She explains what motivates our reactions to these events and shows how to turn them into an opportunity for meaningful change. She encourages readers to note their gut reactions but to avoid acting on them immediately. She then outlines a more thoughtful and reasoned approach for responding to change. Human beings have evolved the capacity to habituate to most life changes, both positive and negative. Lyubomirsky shows how to slow down the adaptation to positive life changes and to enhance our feelings of satisfaction. Marriage, for example, makes people happier for about two years. Lyubomirsky outlines specific strategies for lengthening this honeymoon period, such as practicing appreciation and injecting novelty into the relationship. Adaptation also occurs with job satisfaction. People who are promoted or relocated experience increased satisfaction for a year, then happiness falls to previous levels. Lyubomirsky blames rising job expectations, which ultimately results in disappointment. She describes 5 psychological tools to curb the inflation on work expectations. She also discusses coping strategies for dealing with life’s disappointments and difficulties, including focused attention. Over the past year, this book and 5 others about improving satisfaction in life have been reviewed in this blog: How Will You Measure Your Life (Clayton Christensen); Search Inside Yourself (Tan Chade-Meng); The Secrets of Happy Families (Bruce Feiler); Rainy Brain, Sunny Brain (Elaine Fox); Shiny Objects (James Roberts). Each of these books presents a particular point of view and all are recommended to anyone seeking a meaningful life.